Both as sending and as receiving nations, many constitutional democracies today are experiencing serious, often polarizing controversies over heightened numbers of immigrants and emigrants as well as refugees and asylum seekers. 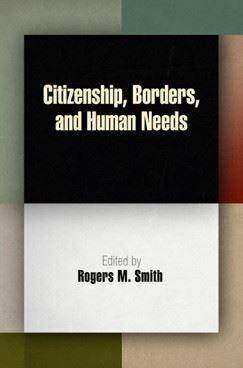 There is intense debate over whether human economic, political, cultural and security needs are really best served by strictly enforcing civic borders, and over whose needs are served, whose are harmed. Some read history as indicating that constitutional democracies benefit from free movement of persons, some see very different lessons. Both empirically and normatively, some argue today that traditional nation-state boundaries for civic membership are becoming obsolete; some find these views utopian or unpatriotic. Scholars from many disciplines and countries will explore these issues in the DCC Workshops and Spring Conference for 2007-2008. The volume for the 2007-08 year is now available here. "Authoring (In)Authenticity, Regulating Religious Tolerance: the Legal and Political Implications of Anti-Conversion Legislation for Indian Secularism"
"Establishing a Democratic Religion: Metaphysics and Democracy in the Debates Over the President's Commission on Higher Education"
"Diversity and the Public Sphere"
"The University at the New Frontier: The Expansion of Higher Education and the Origins of the Student Movements of 1968 in France, Germany and Italy"
"Indigenous Peoples' Courts: Egalitarian Juridical Pluralism, Self-Determination, and the UN Declaration on the Rights of Indigenous Peoples." "Mexico, Indigenous Peoples and Citizenship"
"American Legal Pragmatism and Jim Crow"
"Luck, Responsibility, and Equality in Global Justice"
"Synthetic Slaves and the Living Dead: Rethinking Civil Death, the Thirteenth Amendment and Felon Disenfranchisement"
"Critical Citizens or Loyal Citizens: Exploring the Role of Ideology in Student Speech Rights Cases." "Turnover and Accountability of Appointed and Elected Judges."